District Education Officer K. Sandhya Rani said that the one minute late rule will not apply to the exam this year. Students will be allowed to appear for the exam even if they are late by five minutes to the centre. At the same time, the Directorate has asked students to reach the centre 45 minutes before commencement of the exam. It should be noted that candidates will be given different question paper sets. As per the notification, the candidate must attend the question paper set allotted to them, if not their candidature will be cancelled. The candidate will be disqualified if they appear in an exam centre. If hall tickets lost Students may download from www.manabadi.co.in or http://bseap.org. The control room number will be available 24 hrs from 13th march 2019. Students should not keep any book/notebook/Mobile with them during the examination. Students will not be allowed after 9.35 am into the examination hall. Its better to visit exam center one day in Advance. AP 10th class halltickets or AP SSC hall tickets for writing 10th class exams for the year 2019 are available now from manabadi and government website. 10th Halltickets are essential to write SSC/OSSC Public Examinations. Andhra Pradesh SSC Regular Hall ticketsfor regular candidates, Andhra Pradesh 10th class private Hall ticketsfor Private candidates, AP OSSC Hall tickets and AP SSC Voactional Hall tickets are now available. Directorate of Government Examinations is an independent department functioning under ministry of secondary education, Government of Andhra Pradesh. The department is responsible for conducting the SSC/OSSC Public Examinations, Andhra Pradesh SSC Hall tickets 2019 available to download @ www.manabadi.com, bse.ap.gov.in. Students can check AP SSC (10th) public exam Regular Hall tickets Check here. Andhra Pradesh Board of Secondary Education will conduct SSC Board Exam for Regular as well as for private candidates in the month of March 2019. Candidates for these exam requires SSC Halltickets for the year 2019. Download your AP SSC Hall tickets 2019 From AP board Official website (bse.ap.gov.in) and www.manabadi.com. The 10th halltickets downloaded from the official website should be attested by the school principal of relevant school and the original copy of the signed ssc hall ticket should be carried to the examination centre and to be shown to the invigilator before entering into the centre. and should keep the same in the centre also for any verification by the ssc board members. go through the below links to download your hallticket 10th class. When you will download your admit card or hall ticket for Class 12 March examinations you will see these following details on your admit card. Candidates must confirm these things before going for their examinations. Important Instructions for the Exam etc. If in case the student loses his or her original AP 10thhall ticket of public examination then there is an alternative for them. The students can download a duplicate hall ticket from the official website of www.bseap.org. Follow the procedure below to download the duplicate hall ticket. 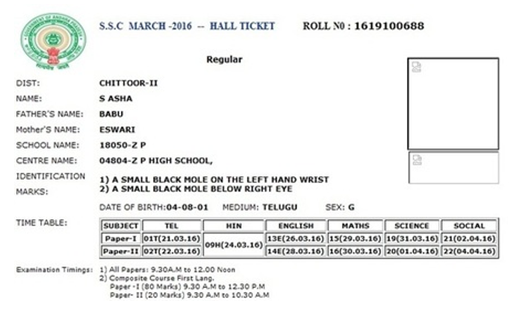 This AP SSC 10th Class Hall Ticket 2019 will display the student photograph with Examination center details. Take a print of this hall ticket and attend your examination according to your center. Follow the instructions mentioned in your hall ticket while going to your examination. The Hall tickets of Directorate of Government Examinations Andhra Pradesh (SSC) Class 10th examinations will be available From 2nd Week of March 2019. The Students who are appearing for the same are required to check the official website bse.gov.in or manabadi.co.in in order to download the hall tickets. After taking out the print out of the hall tickets, the students will have to get it signed by the principal of their school. AP Board is conducting the SSC Regular examinations From March 15, 2019. To 29th March 2019. The hall tickets for the same have been released on the official website of AP board, the link for which is bse.gov.in. Candidate should note TIME TABLE (i.e) Dates against the paper I and II of the subjects appearing. The candidate is advised to visit the centre one or two days in advance to know the location of the centre and transportation facilities available to reach the centre on time daily to avoid tension and confusion. Candidate should verify the particulars printed in the hall ticket and bring to the notice of the forwarding school Head master and the Chief Superintendent of the centre, mistakes if any well in advance. The candidate should be present at the examination centre by 9:00 AM on all the days of examination. Candidate (Regular/Private) should preserve this ?Hall Ticket? for any further future correspondence. Wherever the photo is not printed /manually written hall ticket is received, the H.M. has to affix photo of the candidate under his or her attestation duly affixing the school stamp. IMPORTANT: ?OMR Bar Coding? is extended for all papers ? SSC, OSSC and Vocational SSC. Before the commencement of examination candidate will be supplied Main Answer booklet having 4 pages and printed Bar Coded OMR Sheet having details of Candidate and that day?s examination. The candidate must verify the particulars printed on OMR sheet with his/her particulars such as Roll Number etc., and Staple it, if it belongs to him/her to the main answer book as indicated. In case of discrepancy, he/she should bring it to the notice of the Invigilator and obtain correct OMR Sheet. Then he/she should start answering. Please don?t write Roll Number on any page of Main Answer book, Additional answer book, Map, Graph Sheet and Bit Paper. He/she should write main answer booklet serial number on Graph sheet, map and Bit Paper. All candidates must appear for exam at the centre allotted only, otherwise their performance will be cancelled outright. SECOND LANG: HIN :" HINDI"; TEL : "TELUGU"; SPL ENG: "SPECIAL ENGLISH"
Check if all your details in the Hall ticket are correct. Go to the Examination center once before the day of the exam to become wary of the place. On the day of the exam be there in the center at least before 1 hour to ensure that you will be on time to attend the exam. Make sure to carry the Hall Ticket and all other required materials for the examination. How to Download AP SSC Class 10th hall tickets 2019? BSE Andhra Pradesh official page, www.manabadi.co.in or http://bse.ap.gov.in/ ? visit this page initially or just click the direct link given below. Roll No: Roll no. is the Hall ticket Number which will be unique for every student. District: District where the student belongs to. Name: It is the candidate's name. Father's Name & Mother's Name : The names of the Parents of the student appearing for the exam will also be mentioned in the Hall ticket. Center Name & Address: - This is the most important field. The student needs to clearly check where to go & write the exam. Medium: It is the medium of study of the candidate based on which their examination Paper will depend. All the above personal details of the student mentioned in the Hall Ticket along with the student's Photo (with signature) will be provided to the Board of Secondary Education by the schools where the student belongs to. The student is asked to fill in the application form in the college itself, so he/she must be very care full while filling up the form. It should always be done under the guidance of the candidate's Parents. Exam time is the most important time for the students and they should note certain things. So, to help students we are here to guide them in carrying and prohibiting certain things during examinations. First of all, remember to carry the exam hall ticket as it works like your entry identity which permits you to appear for the exam. Bring your water bottle on the day of the exam, you may not be allowed to go for drinking water. Remember to carry the stationery box with the extra items to help you when your pen finishes off or in any other adversity. Try to bring other important documents like government id, aadhar card, school identity etc. Do not carry electronic gadgets, mobile phone etc in the exam hall as these items are strictly prohibited by the board. Students should not take calculators while appearing for any statistical exams until it is permitted by the board. Remember to check your pockets and stationery box and ensure yourselves that you do not carry any extra paper along with you. If you found guilty your exam will be disqualified. We hope that our article was helpful to you, maintain constant touch with us to know the recent updates about the exam. We wish the best for your exams and preparations, hope you all score well. Please sir.......l want to know my center .........??? 10th class 2019 new hall ticket.